Capsaicin health benefits include anti inflammatory effects. Capsaicin health benefits include pain killing and anti inflammatory effects. It's the heat in red hot chilli peppers like jalapenos and cayenne; not many of us would be into habañeros and the spiciest of them all, the Trinidad Moruga Scorpion. Interestingly habañeros appear more orange than red; that makes them amongst the very richest sources of zeaxanthin, the phytochemical that along with lutein gives protection against age onset macular degeneration. Capsaicin is the heat in chillis; it's found in the main in the placenta and the seeds. Don't discard them; that's where the health benefits are to be found. Capsaicin creams and ointments for rubbing on the skin are useful in many painful conditions including for example arthritis in the fingers, and shingles lesions that have healed but remain painful. Most important though is their effect on malignant cells; it's well researched and reported in journals such as that of the National Cancer Institute. Normal cells undergo what is known as aptosis, forming and then eventually dying; however in cancer they instead continue to proliferate and generally take over. It's complicated biochemistry but, in short, capsaicin has been shown to induce that normally occurring aptosis of cancer cells that they have somehow been able to circumnavigate. It represses the growth of the malignant parts. Scientists report that the oxidative stress that is stimulated by capsaicin contributes to the death of cancer cells by apoptosis; that's the normal process that they have managed to evade. Read more about it in JNCI, volume 94. The American association for cancer research reports in this vein, that capsaicin causes abnormal human prostate cells to undergo cell death, as we said known as aptosis. This anti proliferative effect dramatically slows the growth of those prostate cancer cells. Prostate cancer is the most common non skin malignancy; there are 230,000 new cases every year in the USA, with 29,000 deaths; after relapse no successful treatment exists. Studies from the Cedars-Sinai Medical Centre report that capsaicin inhibits the growth of prostate cancer cells by blocking the NF-kB pathway that is active in many types of the disease. In short, it would appear that daily ingestion of small amounts of capsaicin in the chilli family would have many benefits in both the prevention and treatment of pain syndromes and cancer. Capsaicin health benefits also include causing cancer cells in the prostate to undergo apoptosis; that's the death of normal cells to maintain a balance between new ones that are growing to replace old cells that are dying. Cancer cells have developed a way of avoiding apoptosis by deregulating the genes the control this programmed death of normal cells. The neuralgic pain of diabetes and shingles is highly problematic. The AMA council on drugs reports that capsaicin creams at a concentration of 25-75 parts per 100,000 brought 75 percent relief of these neuralgias but, interestingly only after four weeks. Capsaicin depletes Substance P that transmits painful impulses from the sensory nerve terminals in the skin and joints. Likewise in the treatment of a particularly nasty syndrome that every chiropractor sees very occasionally, reflex sympathetic dystrophy, or causalgia. An injury to a distant part, say the head causes severe disabling pain in the fingers. One of the problems is that chillis are only available from the garden for about six months; how to preserve jalapeno peppers in a useful analog. It's actually very simple and not time consuming, making them obtainable all year round for your food. Here you can read more about prostate gland health. On a daily basis we enjoy hummus using frozen jalapeno with our green salads; it gives the meal a bit of spice and helps the medicine go down. Eating foods like lettuce, kale and spinach on a daily basis is vital for those who want to avoid getting macular degeneration; coupled with capsaicin health benefits we have double protection. This quick hummus recipe can be made in less than ten minutes; five if you do it regularly. On a personal note, my urologist was recently astonished to find my own PSA was 0.9; extremely low at sixty-eight, but that's an anecdote and of no scientific value. We also use a slither of capsaicin health benefits in our eggs Florentine every morning for breakfast, combining all the value in greens, chillis, onion, the joys of free range hens all on toast made from 100% healthy flour, added butter helps the absorption of the carotenes. 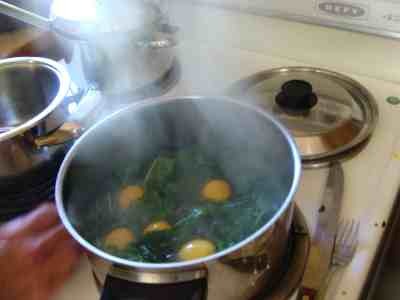 Eggs and spinach too are are good for the eyes. Read more about it at zeaxanthin macular degeneration. 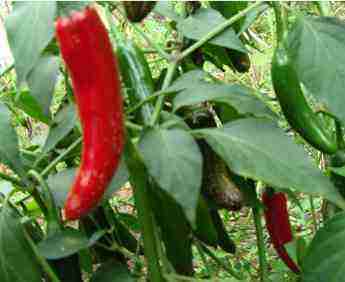 How to grow chili is a subject for every health conscious gardener because of the capsaicin health benefits. They have a long growing season so, if you have cool Springs, start them early in a warm spot or glass house. Luckily the chili family will produce again in the second year if you live in a mild climate; otherwise you have to start new seedlings every Spring. Bright red chilis look splendid in any flower garden. The bright red fruit is so attractive. How to grow chilli is certainly for you if you are suffering from overall pain and inflammation in your body. If you just find them too hot, then growing peppadews is a good alternative. Even though they bear for a long season, you want to make sure that you have chillis available year round; if you are going to go to the trouble to concern yourself with how to grow chilli, then you might as well also consider how to preserve jalapeno peppers. It's a good deal easier than growing the chillis; in fact it's a cinch. 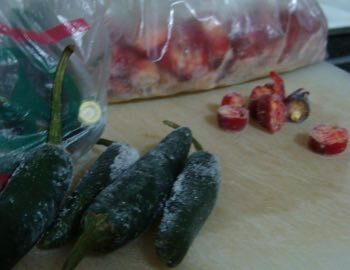 Just chop them up and freeze them; get the details at how to preserve jalapeno peppers. 2. Capsaicin blocks substance P that transmits painful impulses.